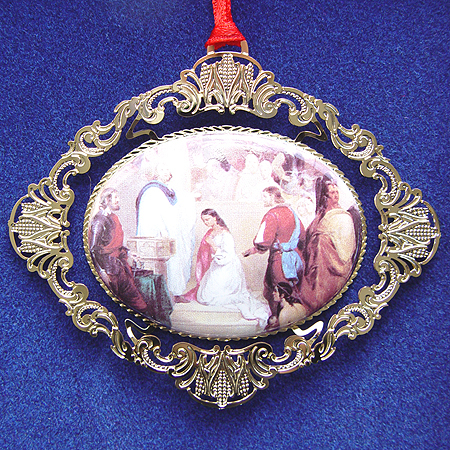 The 1997 Baptism of Pocahontas ornament is the Second edition in the series, "America's Christmas Ornament." 24kt gold-plated frame features corn design used by architect Benjamin Henry LaTrobe on Capitol columns. Beautiful oval ceramic center features detail from artist John G. Chapman's Rotunda painting, "The Baptism of Pocahontas." Ornament is gift boxed with the history of this piece.